Hollybeary Creations : Hello ..
Hello everyone.. 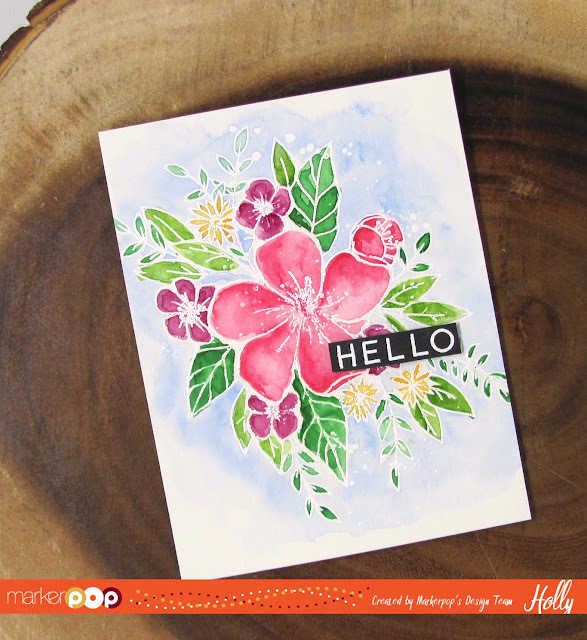 I was over on the MarkerPop Blog this week with another watercolor card and process video. I’m using the Concord & 9th Hello Lovely set and some Gansai Tambi Watercolors. I started by stamping the flower image onto a piece of watercolor paper and then I heat embossed it using some White embossing powder. Then I taped the image panel to a board using some painter’s tape. I added some clear water around the image and then I dropped in some Light Blue using a wet paintbrush. This is the wet on wet technique. Then I heat set the area with my heat tool. I repeated the same process with the rest of the image. Adding in color within each embossed area and drying in between layers. Once the image was dry I trimmed the panel to 4 1/4″ x 5 1/2″ and added it to a top folding Black card base. 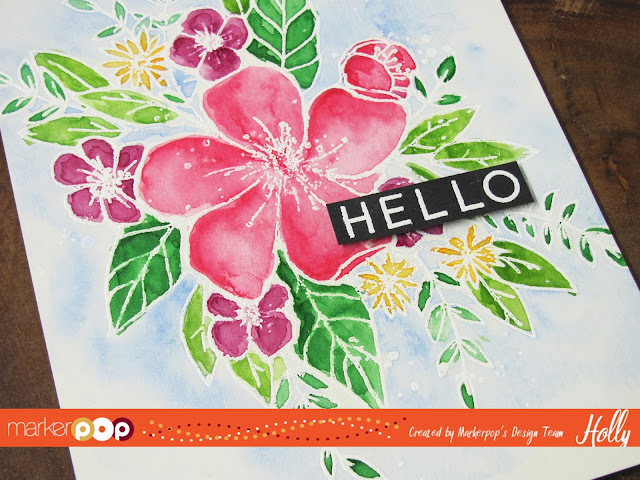 I stamped Hello from the same set and heat embossed it onto a piece of Black card stock using White embossing powder and trimmed it out with my large scissors. I adhered it to the image with some foam tape. This is a great image to practice watercolor with, it has lots of great large images and it can be embossed. Don't forget to enter our Watercolor Giveaway.. you can find all the details in this post here.